Sales Sheets is rated 4.7 out of 5 by 3. With our vast product options, you’ll be able to design high-quality sales sheets customized to fit your business. "Our sales sheets are absolutely critical in sharing pricing and product information with current clients and prospects. PrintPlace has the best web interface in the business. We are very pleased with the services of PrintPlace.com"
Rated 5 out of 5 by Brewfact from Excellent Quality Very satisfied with the print quality, quick turn around and value. Rated 5 out of 5 by Tracy from Great all around Excellent service, timely and great quality. We always order from them and have never been disappointed. Rated 4 out of 5 by Pattydd from A Go To Source for Sales Sheet Printing We have consistently used Print Place for sales sheet printing for the past five years. They offer a good quality product at a fair price with a dependable turnaround. Printing sales sheets, or sell sheets, as they are often called, is affordable yet fast with our online pricing and ordering tool. They are a great way to provide information in a simple handout about your product or service. You can even add hole drilling so your sales sheets can be organized in a binder for easy reference. Utilizing professional quality sell sheets for a presentation or meeting makes certain the full value of your idea is received. We will help make this happen with full-color sales sheets and our quality guarantee. Our sales sheet layout templates will help you determine the exact dimensions and other artwork requirements needed for printing. Downloading of a guide in your preferred file format is available from a desktop PC. Save time and money by printing and mailing under one roof. Mailing specifications for sell sheets are based on the folded dimensions, and depend on letter or flat requirements. (See “mailing requirements” below to set up your sell sheet design for best postal rates). Our direct mail services include processing 1 mailing list, duplication removal if requested, CASS Certification, inkjet addressing, and postal presorting for automation rates. Our direct mail services cost is $24 for an order of 1,000 sell sheets with an $85 setup fee (minimum 250 pieces). Double tabbing is required for folded sell sheets mailing at letter rates. Double tabbing can be added during the ordering process. Since the primary purpose of your sell sheet is to sell your product or service, the first item of business is making sure your information is easy to read. Write a dynamic headline that draws clients in, use short paragraphs or bullet points, and use subheadings for easier reading. Leave white space between text areas for an appealing, clutter-free design. Graphics and images also visually break up blocks of text. Maximize the advantage of printing in full color by using high resolution photographs and design elements. 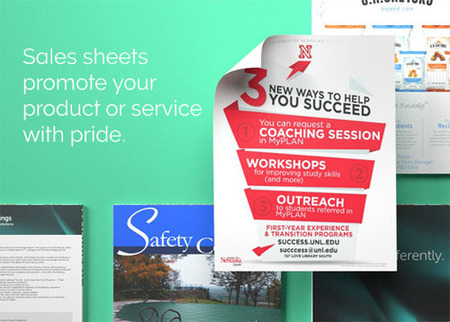 Utilize our full bleed printing by “bleeding” your design elements and photographs off the edge of the page. Consider adding high gloss UV coating to really make your images pop. Before you complete your order for sales sheet printing, don’t forget to include your contact information, so clients can get in touch with you at a later date.